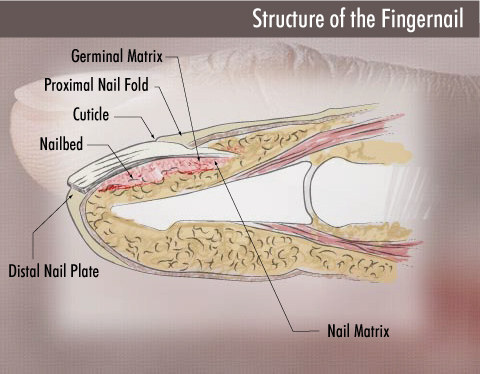 Anatomy of your fingernails: the nail plate! The nail plate – or ‘body of the nail’ – is a protective shield, shielding the delicate tissues of the underlying Nail Bed! The overall growth speed of the nail plate is approximately 3mm in a month – though this speed varies from person to person. And growth speed also varies with lot’s of (im)personal circumstances such as: age, health, food intake, climate, seasons. So, it may take up to 6 months to grow a full nail plate, which implicates that the fingernail can mirror diseases of the nail back to 6 months!